During a pre-purchase examination, our experienced vets look for subtle problems which are easily overlooked in the excitement of making a new purchase. These conditions may render the horse unsuitable for purpose or reduce the value of the horse for resale. We offer both 2 stage and 5 stage pre-purchase examinations. They can be caried out at your yard or at our equine clinic. 1st stage – Passport and microchip check, eyes, body, heart, lungs, feet, front teeth, conformation etc. 2nd stage – Dynamic assessment including flexion tests and lunging on both firm and soft surfaces. We highly recommend a full, 5-stage examination with a blood sample (which is stored for 6 months). Sometimes a shortened version (2 stage) is chosen e.g. for unbroken horses. Please do not hesitate to contact us should you wish to discuss your requirements. 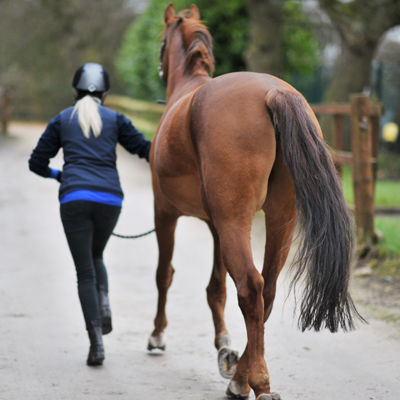 Please note: An examination for insurance cannot be performed in favour of a pre-purchase examination if you are intending to purchase a new horse.